R.M.S. OLYMPIC was laid down in 1908 being the first of the Olympic class at the Harland & Wolff yards in Belfast. She took two and a half years to build and along side her was the ill fated TITANIC which was laid down as the second in the Olympic class, Britannic was the third and last she never entered the passenger service as she was sunk during the first world war. Atlantic crossing to New York in 1912 for two persons in her top suites would have cost £557.00 the equivalent today of £32,000. During the first world war she carried thousands of Canadian and American troops across the Atlantic and on one occasion rammed and sank a German u-boat. When taken out of service she was bought by Sir John Jarvis for £100,000. He sold her to Thomas Ward Ltd on the understanding that the vessel would be broken up at Jarrow-on-Tyne in order to relieve the serious unemployment in the North East of England. At the auction of Olympics fittings at Jarrow were paint makers Smith & Walton of Haltwhistle. 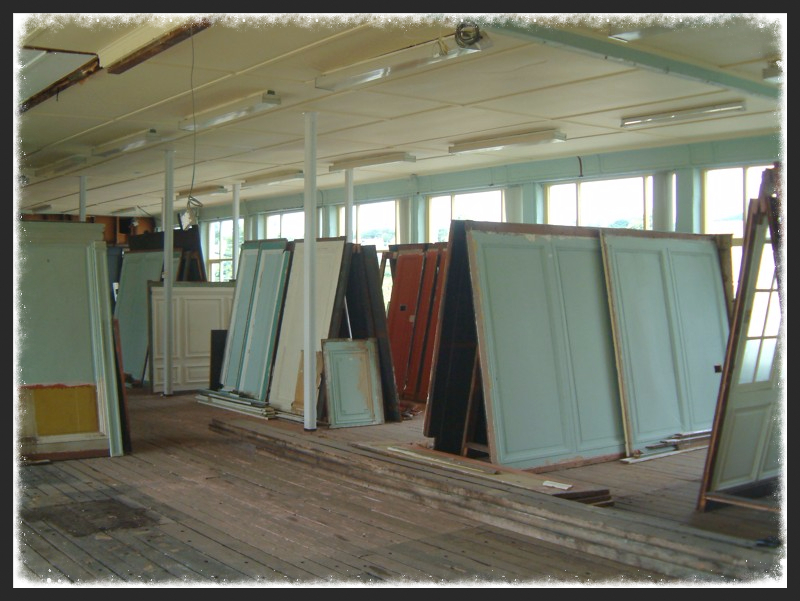 They were there to buy panelling and fittings to fit out an office block and canteen in a factory unit at the works. They paid a total of £800.00 on fittings the equivalent of £48,000 today. It has to be remembered that this was during the depression and these fittings were the cheapest way of getting materials for the office block as apposed to any thought of saving any maritime history. However it has to be said that Smith & Walton did a great job of installing the fittings and they gave many years of service. In later years they were appreciated for there historical Maritime connection with visits from Titanic enthusiasts world wide. Some examples from the 1935 auction catalogue of items bought are :- Marconi Telegraph Room lot 136 A pair of carved Oak open arm-chairs in morocco leather, a ditto stained as Mahogany, a coloured arm-chair, two paper baskets, a coca-fibre mat and a Mahogany rail-back library chair. They paid 90 shillings for this lot. Second Class Library Lot 3819 The Parquet flooring as laid about 6 yards x 11 yards. They paid £10.00 for this (this was used for the flooring in the board room at Haltwhistle). The office block and canteen were used until 2004 when the fittings were offered for sale by auction at the works on Saturday 4th September. A huge amount of paneling was removed from the factory. This is just a small selection of timbers that went to auction. We are very fortunate to have been given the opportunity to buy a number of different timbers from R.M.S Olympic direct from Mr Cowell, the former owner of the Haltwhistle site.